At Foulkes Vision, our Chicago-area ophthalmologist understands that chronic dry eye syndrome may arise due to a variety of reasons, including dehydration, certain medications, long-term contact lens use, as part of a medical condition, or as an occasional side effect of such vision correction procedures. If you’re one of the 10 million Americans who suffers from dry eye syndrome, a nagging condition in which your natural tear production fails to adequately lubricate your eyes, please call Foulkes Vision in Lombard, Illinois, at 630-724-1400. We can provide relief for your discomfort and potentially vision-disabling symptoms. Do You Have Chronic Dry Eye Syndrome? Inflammation and drying of the conjunctiva, or the mucous membrane that protects the eye. The likelihood that your will develop some variation of this condition increases with age. The good news is that your treatment options include over-the-counter eye drops and doctor-administered solutions. Over-the-Counter Eye Drops ─ For most people, this is the first stop in dry eye treatment. Unfortunately, this approach will provide temporary relief at best and generally provide little long-term aid with the problem. Restasis® ─ This medication administered through eye drops better enables your eyes to make natural tears. This FDA-approved solution from your eye doctor also reduces eye inflammation and irritation. Punctal Plugs ─ In moderate to severe cases of dry eye syndrome, your Chicago ophthalmologist may suggest a slightly more aggressive treatment. 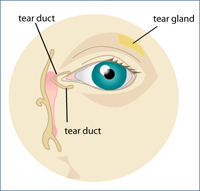 When your condition fails to respond to eye drops alone, the doctor can insert this tiny, effective device into your tear duct to help block at the corner of your eye that reduces tear drainage. This is a common solution for patients suffering from side effects from LASIK or KAMRA™. Eye Vitamins and Omega 3 Fish Oil ─ Although the science behind this strategy remains thin, nutritional solutions to medication conditions in general are gaining favor within the medical community. Proponents of this dry eye treatment suggest boosting your intake of foods containing Omega 3 fatty acids such as walnuts, cod liver oil, flax seed oil, primrose oil, and cold-water fish. Vitamin A, which is found in eggs and dark green or yellow vegetables, helps sustain proper eye moisture. If you have questions about dry eye treatment options, please contact Foulkes Vision in Lombard, Illinois, online or by telephone to book an appointment with our skilled Chicago-area eye doctor: 630-724-1400.